Welcome to my website!!! I am producing this site as a location for my research on many UFO cases. My complete resume is a Word file at Click Here. Below are the research papers I have written. THREE MINUTES IN JUNE, the UFO sighting that changed the world. from Amazon.com. This is the only book dedicated to the analysis and understanding of the first publicized "flying saucer" sighting. The book is a "must read" for any person who is serious about understanding the UFO subject. You can also get the book in which I discuss the meaning and social impact of UFO abductions, Abduction in My Family at Amazon or autographed by me through this website. This book is a unique form of literature, "Faction", in which a fact book, complete with references, is woven into an interesting novel that illustrates many of the unique characteristic of the abduction phenomenon. In this book I have also discussed possibilities for the future. For further discussion see FUTUREugh. I also introduced the idea of a fundamental unit of intelligence. For further discussion click on INTELLECTON. See Richard's web site for "what they are saying about the book" and Amazon.com for reviews. SEVERAL NEW PIECES FROM MY CD HAVE BEEN ADDED TO THE PLAYABLE COLLECTION HERE. And now, before getting to the good UFO stuff, Another Side of Me. I have played the piano longer than I have investigated UFOs. I now have a CD of my music. Interested? >Click Here Listen to sample compositions (files in mp3 format) including the unique Flight of the Bumble Boogie ("boogie.mp3"):click here. Want more? Get a CD from my "Joy of Ivories" series. Contact brumac@compuserve.com. Like classic country or honkytonk music? Check out my daughter and her very popular New Orleans band (recently toured Europe) at GAL HOLIDAY. TESLA! Interested in The Master of Lightning? Send me an email if you are interested in making a Hollywood-level action movie based on the life and accomplishments of Nicola Tesla. Script and possible theme music already written. "ANALYSIS OF SUPPOSED UAP IMAGES IN VIDEOS TAKEN DURING THE NOVEMBER 2010 EL BOSQUE AIR SHOW"
This interesting and timely book stars Capt. Edward Ruppelt, the man who tried to convert the Air Force effort at UFO investigation to a scientific "nuts and bolts" operation. He was partially successful but just as his efforts were about to succeed, the higher ups, in particular General John Samford, Director of Intelligence, decided it was better to "cover up" the findings of the Air Force investigative projects. The history of Ruppelt's struggles with the Air Force are well presented in this book. REVIEW OF DR. JOHN ALEXANDER'S BOOK If you are convinced that the government has a secret UFO project this book could "rock your world." According to Dr. Alexander, there is no group controlling top secret UFO information. There are several important consequences of this finding (or lack of finding): there will be no disclosure (nothing to disclose), there has been no alien technology transfer and there probably is no Roswell. Are you feeling sick yet? Better check out this book. It contains much information that the serious ufologist should know about how the government works and shows why a "cover up" is unlikely. There are discussions of numerous other topics as well. On the bright side, Dr. Alexander argues that at least some "UFOs are real" and probably represent ET or "other intelligences." Click HERE to see my review and commentary on his book. WHAT IF THEY ARE REAL? What happens "post-disclosure?" I began to think about that way back in late 1986 when I first learned about the MJ-12 "Eisenhower Briefing Document." At that time I thought it might "blow the lid off" and force the government to a "state of disclosure." 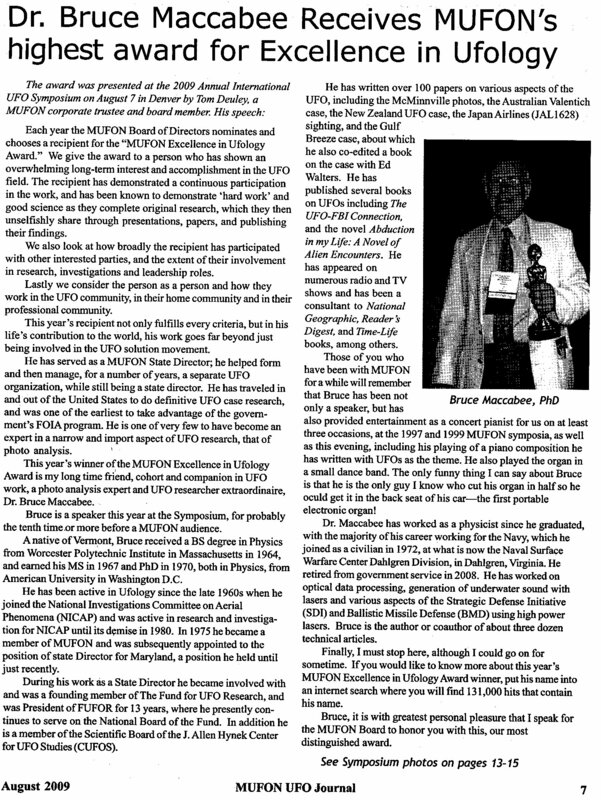 Obviously that didn't happen, but the thinking that went into the article which I published in the MUFON Journal are still pertinent to disclosure if it happened tomorrow, next year or decades from now. Click HERE. WEIRD "PREDATOR" EFFECT IN THE FOREST Jan saw and photographed a weird distortion effect while sitting in a deer stand. Is this related to a nearby UFO sighting? Click HERE. NIGHTLINE UFO 1996 FOR THE RECORD: During the late spring of 1996 many people were anticipating the early July opening of the blockbuster UFO "epic" film, INDEPENDENCE DAY . It was during this time that I was contacted by the ABC Nightline show and asked to appear on a special documentary "SETI and UFO" show they planned to do in early July. 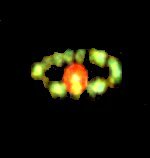 I was told that they had a video of "strange lights" obtained from a telescope in Hawaii which normally did classified research. They wanted me to view and analyze the video "live" on camera. They would not let me see it first. I disliked this requirement that I couldn't view the video first because I suspected they were going to try to make me look like a fool (for claiming the lights were related to ET), but I did it anyway. Probably few people even recall this rather good documentary and fewer still recall the video of strange lights. Nevertheless, because ABC News has recently (2007) released this documentary (available from Amazon) I feel that I should "set the record straight" regarding the "UFO video." To learn about the difficulties of this sort of research and to learn what "it" probably was, click HERE. Note, by the way, that I reported to Nightline the final result of my research but Nightline never reported that to the television audience. HANGZHOU "AIRPORT SHUTDOWN" PHOTOS At about 8 PM, July 7, 2010, the airport at Hangzhou, China, was shut down after pilots claimed they saw a UFO over the airport. News stories of this event included one or more photos of a strange looking "object" in the sky over Hangzhou. These stories implied that the photo(s) showed the "airport UFO." Analysis shows that the photographed object was probably a police helicopter. click HERE.
. The details of the discovery are presented HERE. SCIENTIFIC STUDY OF UNIDENTIFIED FLYING OBJECTS: this is my summary and analysis of Project Blue Book Special Report #14. This is still the premier statistical study of UFO reports. During my study of this report I discovered some facts about the data which were not previously known. Click HERE and download the Power Point presentation (3.5 MB). THE LEGACY OF 1952: I have now enhanced my history of the very important year, 1952. You can read the original html version below (1952 Year of the UFO) or buy the book with the more "brilliant" version (more colorful, more illustrations including copies of newspaper articles) at Amazon. 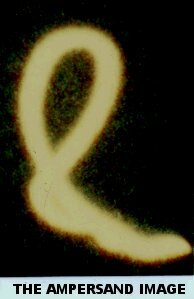 PHOENIX LIGHTS: A newly published analysis of the Phoenix Light videos of March 13, 1997 is now available to accompany the original analysis presented below. This supplementary analysis provides graphs of the falling lights and also a recalculation of the distances and angles from the locations of Krzyston and Rairdon to the location of light 9, the highest light in the "Krzyston Arc." To download the WORD document click here. FLYING CHRISTMAS TREE? Just in time for CHRISTMAS 24 years later..."The Case of the Flying Christmas Tree" is (finally) published here. Phil Klass suggested (in 1985) that this might be the "Rosetta Stone" for ufology. I don't think so, but it is interesting anyway. Download the WORD file HERE. ACCELERATION!!! TRUFOs are fast. But SPEED isn't everything.... The important thing is how fast you can get up to speed. TRUFOs can get up to high speed in "no" time. And they disappear. Find out what we know about UFO acceleration. click here and keep your eyes open. Never know what you might see - briefly - as it zips by! CHALLENGING THE PARADIGM! The "conventional wisdom" is that UFOs/AFCs (alien flying craft) are not real (everything is explainable). (Note: kooks and nuts say otherwise. See why in this article.) Therefore it is difficult at best to publish papers on UFO investigations in mainstream refereed technical journals. Most such attempts are rejected by the editors. However, sometimes one is lucky and sometimes you win. I did...once. To see how that came about CLICK HERE and challenge the paradigm whenever possible! NOTICE: PUBLICATION OF A BREAKTHROUGH PAPER in the Journal of the British Interplanetary Society (JBIS): "Inflation Theory Implications for Extraterrestrial Visitations" by Deardorff, Haisch, Maccabee and Puthoff (JBIS,Vol. 58, pg 43, 2005). This is the first(? )article in a refereed, mainstream science journal to propose studying UFO reports to determine if any are evidence of ET visitation. To access this report (JBISpaper.pdf) CLICK HERE . NEW ZEALAND SIGHTINGS of December 31, 1978 are briefly mentioned in the JBIS paper (see above) as an example of UFO sightings that can't be explained in terms of known physical phenomena. Although several such reports were listed in the original version of the paper, only these sightings were "allowed through" the review process, apparently because they are the only sightings to be previously published in a refereed science journal (Applied Optics) and because they are the only ones known (to civilians) to involve coincident radar-visual detection AND color movie film. You can read about these sightings by downloading the file at CLICK HERE. (WORD document, 1.7 MB). For more in-depth analysis see also the document below listed as "RADARUFOS" (immediately below this) and, farther down on this page, the Flashing Light document and the Squid Boat document. NEW ZEALAND RADAR SIGHTING: Some of the most technically interesting sightings are those in which radar plays a role. There are many "radar only" sightings (no coincident visual sightings). Of greater interest are the radar-visual cases in which (a) witness(es) report on object in the same direction and undergoing the same dynamics as a radar target. In this paper I discuss a radar-only case and also the only RADAR-VISUAL AND PHOTOGRAPHIC case that I know of, namely the New Zealand sightings of 1978. Download RADARUFOS (WORD document; about 240K). MEXICO DOD SIGHTING of March 5, 2004 UPDATE TO DECEMBER 27, 2004. My analysis of the sighting is for download. I initially withheld my report in the hope that the Mexican Air Force would fly a test flight. However, they didn't fly such a flight. The first radar target remains unexplained because it had a rather large radar cross-section and was traveling at high speed, yet was "invisible" to the eyes of the crew and to the infra-red viewing system ("FLIR") which means that it was not generating heat. The the flir "lights" were quite far from the plane. They may have been above ground and therefore moving or they may have been at ground level. After 2 years I am still waiting for an experiment that could prove whether or not some or all of the flir lights could be ground sources, in particular, gas-burnoff flames from oil wells. The detailed report can be downloaded as a WORD document (.doc): click here . You might also scroll down and click on the Bubba sightings listed below (Gulf Breeze Bubba) and then scroll down to the section labelled "Invisible Light". This describes an a sighting that involved infrared sensitive film. It appears to show that a UFO changed its spectrum, moving from predominantly visible into the so-called "near infrared." 1952 THE YEAR OF THE UFO: 50 years ago the most amazing concentration of UFO sightings occurred in the USA (and some in other countries). In a period of three months the Air Force collected about 1000 sightings. Why didn't this change the world? Here is your chance to return with me to yesteryear and find out what happened 50 years ago and why the world did not change as a result. So Click Here and go back in time to when ufology was young. KENNETH ARNOLD: THE CASE THAT STARTED IT ALL! !....well, almost. The ultimate Arnold history and analysis is presented in full detail in the book THREE MINUTES IN JUNE available at Amazon or, if you want an autographed copy contact me by email at brumac@compuserve.com. The first publicized sighting was that of Kenneth Arnold whose sighting was June 24, 1947... a day that will live in "famy" or infamy, depending upon your opinion of the subject of flying saucers. Anyone serious about the UFO subject should understand the Arnold case, which is a microcosm of much of what followed. Learn All About It, including the many proposed explanations (pelicans, anyone?) from the book. MEIER SPACESHIP OR..... not? What is that moving (swinging?) back and forth over a tree that no longer exists in the first movie by famous contactee Eduard Albert Meier-Zafiriou, aka "Billy" Meier? You can, perhaps, make your own conclusion based on the analysis presented HERE (click). FLASHING LIGHT film from NEW ZEALAND! What was that triangle of lights that was observed, filmed and apparently also detected on radar in December, 1978? Certainly not a Squid Boat! (See the HIGH FLYING SQUID BOAT sighting discussed below). The New Zealand sightings may be the most "instrumented" in civilian ufology, with multiple witnesses, TWO INDEPENDENT TAPE RECORDINGS MADE DURING THE SIGHTINGS(! ), 16 mm color movie film and ground and air radar. Read about these world famous sightings: FLASHING LIGHT or the so called SQUID BOAT sighting. Some weird photos depict paranormal events....maybe. But does this one? What do you think? (Recent experiments indicate that could have been the camera strap that was in front of the lens. It appears white because of the extreme brightness of the reflection from the strap!) See (REMOVED at the request of the owner of the photos of a dove and white "vortex"). CAVITT EMPTOR!!! Skeptics who are appealing to the testimony of Sheridan Cavitt to support the MOGUL Hypothesis...BEWARE! His testimony is about as solid as a Swiss Cheese. He is an important government-Roswell witness AGAINST the Mogul explanation. Click on CAVITT EMPTOR! to find out why! What would you say if the President called? I don't know what I would say because the President didn't call. But the CIA (gulp!) did, in the middle of one sunny April afternoon in 1993. "Please prepare a briefing for the President's Science advisor on UFOs and, oh, by the way, have it ready by 8 AM tomorrow morning." I did the best I could! Between November 1990 and July 1992 there were recorded over 150 sightings of a red light that would flash bright white as it moved through the sky. There were also sighitngs of rings of light. I saw one of these myself. Read about my sighting and others, including infrared camera photos and a SPECTRUM OF BUBBA (a diffraction grating was placed inside a camera). They (the skeptics) said it couldn't be done: a UFO sighting by Ed Walters, with photos, in the presence of other witnesses. But it happened on Jan 8, 1990. Pretty good sighting, too. The strangest photo wasn't taken by Ed!! See for yourself. The world famous New Zealand sightings (December 31, 1978) feature multiple witnesses, a 16 mm color movie and radar detections (the only civilian radar-visual-movie UFO case). This sighting preceeded the flashing light sighting discussed above on this web page. This sighting has been "explained" as unburned meteors, drug runners, light reflected from the breasts of birds (even though the airplane was higher than the birds!) and.... yes... a squid boat. The optical analysis of this sighting was reported in Applied Optics!! You never know what you might see at high altitudes near a thunderstorm. The pilot said it looked like a coin seen on edge. The camera shows a glowing elliptical light. Did the camera detect radiation the pilot couldn't see? Magnetic UFO in Gulf Breeze? Perhaps some UFOs have a Magnetic Personality! In this case a strong magnetic field was detected after a sighting. In 1904 sailors aboard the U.S.S. Supply saw a truly remarkable sight. They may not have realized just how remarkable!! In 1978 a weather satellite of the Defense Department created this photo. What is it? New York Academy of Voodoo Science? � copyright B. Maccabee, 2000. All rights reserved.